I've always fancied the idea of a model airliner and with the availability of gas turbine engines they are now a reality. Also I hoped a large model would be more sedate than the fighter jets and sports jets. A subscription to RCJI and no missus to say "You can't afford that" is a dangerous combination and so when I saw that a kit of the L1011 Tristar was available from PCM, I decided to go for it! I also ordered the purpose-built undercarriage and wheel set made by Robart which is of superb quality and well worth the expense. As it happened I also got a good deal on the Simjet AES1700 turbine from West London Models. When the kit arrived by air freight at East Midlands, I had to pay a fortune for import duty and handling. There is probably a way round this if you get it marked as 'aircraft parts' or something. The first thing I did when I got it home was to tape it all together. What had I done! It is enormous. I then searched the internet for an actual example to model. The model is actually of the shortened L1011-500 variant, but as I was only going for stand-off scale I didn't let that influence my choice of livery. 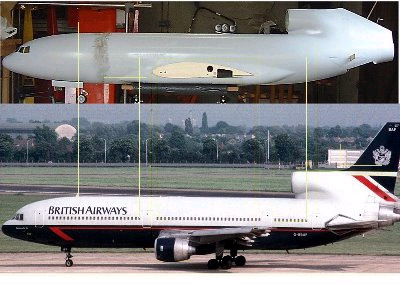 I wanted to do a classic British Airways scheme and found pictures of 'Babacombe Bay' that had my nickname as part of the registation, G-BBAF. 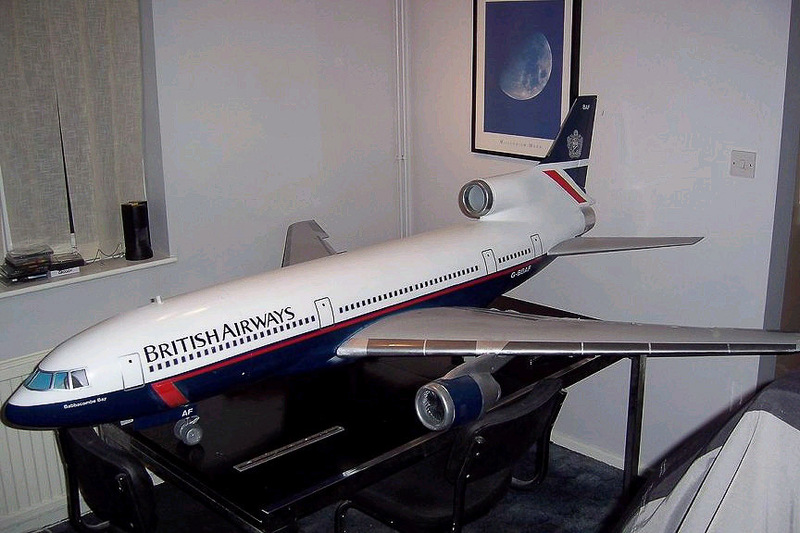 The kit is of average quality with a two-part moulded fibreglass fuselage with limited detail. Each wing is in two parts, the inner being of lite ply and balsa and the outer is balsa covered foam. The tail and fin are also balsa covered foam. This is how I transferred the positions of the doors and windows etc. from my reference photo to the model. 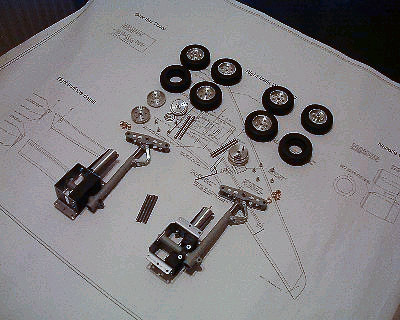 The main gear was easy to assemble, but the installation into the model was tricky and I ended up enlarging the gear doors by about a cm to allow clearance. A good friend of mine, John Hoggard, assisted with some of the mechanical bits. He is a master with the Dremel. Unfortunately he wasn't available the day I had to glass the wings. Wow, does that epoxy go off quick! Still, not too bad for my first time and they are big wings. Next time I will spend more time sanding and filing before glassing, but you live and learn. 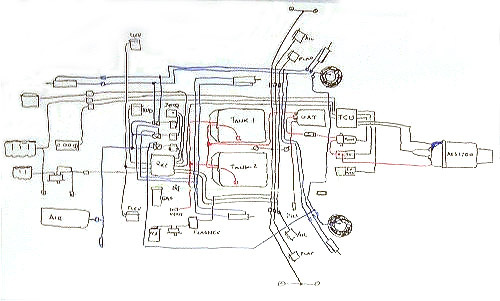 I sketched out the gas, air, fuel and electric systems before installation. There are 2 x 1.5 ltr main tanks plus a UAT. There are 4 batteries, 2 for the radio, 1 for the turbine and 1 for the lights. 11 servos, all Futaba. 1 Gas cylinder for the onboard start and 2 air reservoirs. The decals for the model exterior were another challenge. I did the crests on the tail fin myself. I had an old BA press pack that had the old 'To Fly To Serve' crest on it. After a bit of mucking about on the PC I was able to print them in silver on a LaserJet printer using some special paper from Paper Direct. The name and the registration are required in white. Have you ever tried to print white? So I sent off to a company that does vinyl graphics for cars and after some initial misunderstandings they provided the decals for the name and the 'British Airways'. I've run the engine in the model and tested the under carriage. I am about ready for taxi trials and that all important maiden flight. I may convert to 2.4GHz and I need to sort out the lights but I'm fast running out of excuses. The kit came with a basic, 3 bits of balsa, cockpit arrangement. 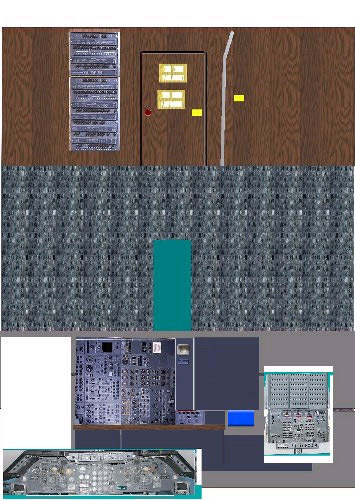 So with pictures from www.airliner.net I managed to reproduce the cockpit main and engineer's panels. The centre console is the turbine control panel which is switched on via linkages to a pitot out the bottom of the aircraft. Also, the radio fin on the top of the cockpit is the radio switch.